A common tendency when watering your garden plants is wasting water through runoffs. This is especially so in a couple of conditions: the ground has a slope or furrows that immediately channel water to other areas and; the stream of water is too strong that it splashes and flows away before being absorbed by the soil. These conditions prevent water from getting to where it is most needed - the garden plant's roots. 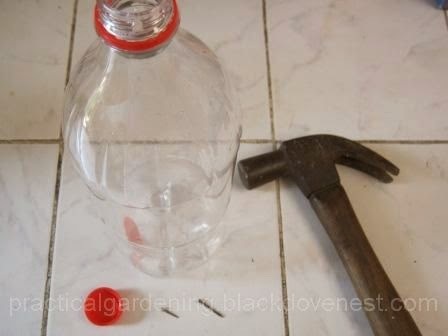 Remove the plastic cap of a 2-liter soda pop plastic bottle. 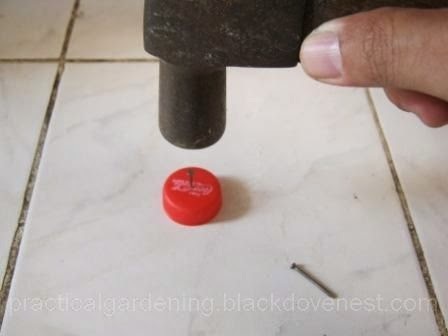 Create a pilot hole by punching a shoe tack at the center of the plastic cap as shown below. The pilot hole will then allow you to punch a bigger hole. Create a slightly bigger hole by punching a 1-inch (or less) nail into the pilot hole. 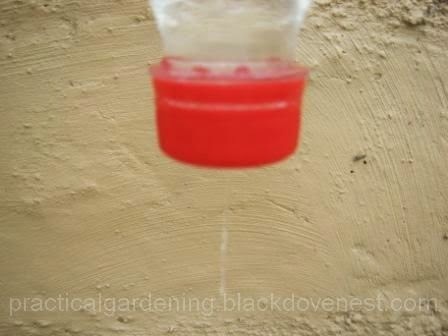 Remember, the size of the cap's hole will determine the watering flow rate. A small hole will trickle the water while a bigger hole will have a faster stream and will empty your irrigation bottle quickly. Turn the 2-liter plastic bottle with its bottom up. Punch a 1/4" diameter hole anywhere on the plastic bottom's surface. This bottom hole will prevent vacuum and allow the water to flow out of the cap hole when the irrigation bottle is inverted. Dig a hole roughly 2-inch deep and 2-inch wide on the ground near the garden plant's base. Put a few small stones, pebbles or tiny pieces of broken garden pot into the hole. The stones should form a barrier between the irrigation bottle's cap and the garden soil. The idea is to prevent garden soil from clogging the cap hole. Remove the irrigation bottle's cap and hold the bottom of the bottle as shown below. Fill the empty bottle with water while your index finger covers the bottom hole. In the above picture, encircled in red, notice how my left index finger plugs the bottom hole to keep the water from flowing out. When the bottle is filled, replace the bottle cap. Be sure the cap is clean, inside and out with no debris covering the cap hole. 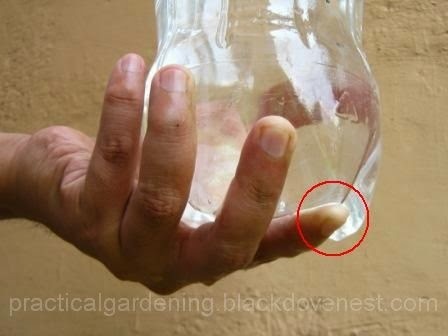 With your index finger still covering the bottom hole, bring the irrigation bottle to your garden plant. Invert the irrigation bottle so the cap is at the bottom. When you remove your index finger from the bottom hole, water from the cap hole should start to stream out. Slightly squeeze on the irrigation bottle if a bit of debris still covers the cap hole. Position the irrigation bottle into the ground hole as shown below. 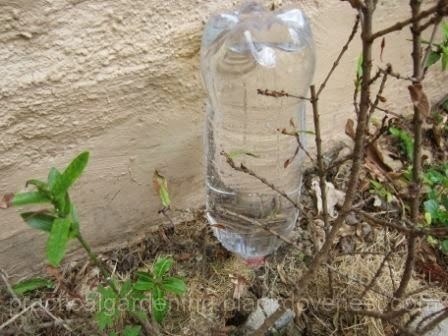 Be sure to rest the bottle on something that's stable like a wall so it won't fall on any garden plant's soft parts. 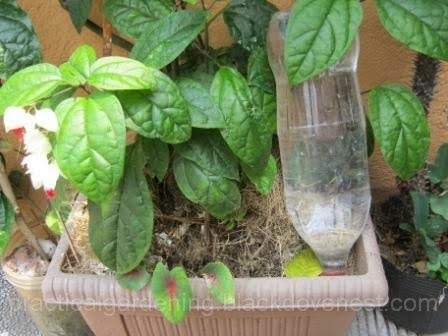 You could also position the irrigation bottle in a garden pot or container. This simple DIY project is cheap and only requires ordinary items as mentioned above. You don't even need a drill to create holes on the irrigation bottle and cap. Depending on the size of the cap hole, the bottle can be emptied in over 2 hours of slow dripping. This is a far more efficient manner of watering garden plants where you save water that otherwise is wasted via runoffs and rapid evaporation. This is especially helpful during the hot, dry season. We store rainwater in plastic drums during the rainy season and then use that for drip irrigation in the dry season. Wow, this is good! I'm concerned about the amount of water I use to water our many plants especially this hot summer months. How many bottles for drip irrigation do you have in your garden? Should you use this only for certain plants? How about herbs though they don't want too much water, lest they melt. But, isn't it that if you store rainwater, there is danger of dengue mosquitoes? Hi Corrine. I sometimes have 5 drip bottles around. I only use them for plants that quickly wilt under the hot sun. I use a rain barrel for collecting rainwater. You may want to see this link: Collecting Rainwater with a Rain Barrel on how to prevent mosquitoes from breeding. A much easier way to create the hole is to use a small gimlet or even an old wine corkscrew. Because these are usually tapered, it's possible to adjust the size of the hole easily.